But I can't fill all the circle, there are some edges that doesn't create. I've looked many manuals and it is supposed to work well as I'm doing. What am I doing wrong? Mirror's axes are specified by the object, not by the world. So the transforms what you do in object mode don't count, only what you do in edit mode. You generated the circle in object mode, then rotated, then went to edit mode. You are supposed to go in edit mode, then rotate with 22,5°. All the transforms must be 0. You can apply the transforms by hit CTRL-a and select rotate and scale. Not the answer you're looking for? Browse other questions tagged modifiers mirror or ask your own question. 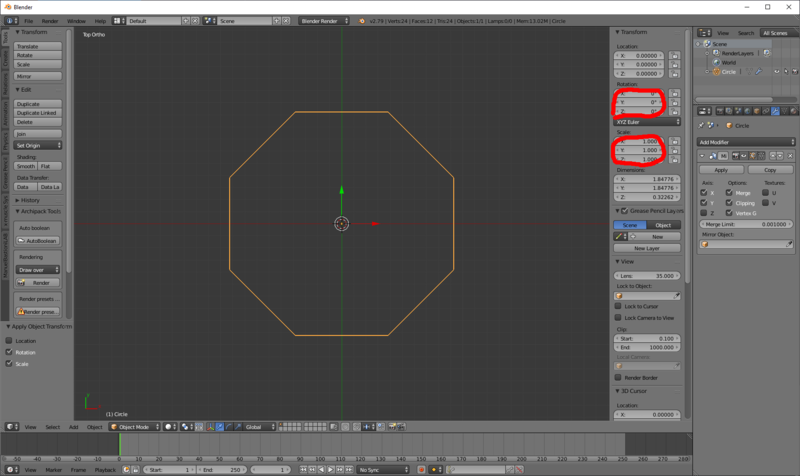 Mirror modifier is not working, no mirrored object? Mirror object around a circle?